The digital prints of Andrej Tisma "Food in Context" are the most unusual juxtapositions and critical confrontations with the contemporary civilization the kind of which we have not had a chance to see for a long time. At first glance, the viewer gets an impression that the combinations of the sights in these works are incongruous, both thematically and in an ethical, social and formal sense. Both halves of the pictures are perfect photos, but - whilst watching the one half is mouthwatering, the other half makes us feel uneasy, even disgusted. The author, Andrej Tisma, who has been taking photos and writing for 35 years now, has not put these things in these relationships by chance or inadvertently. Rather, he has tackled a subject dealt with by the arts ever since: luxury and transience, which in times of opulence was not politically correct and has therefore been forgotten. The series of works "Food in Context" visually incurs completely contradictory feelings, leading to one final wise conclusion - you are yourself as transient as the banal space around you, or as the offerings of a good coffeshop or delicacies of a cold buffet. The aggressiveness of these furious opposites is based on the directness of the way the motifs have been photographed: there is nothing in between the objective and the object, there is no intermediary, no concealing, the viewer's glance falls directly on the detail in focus. 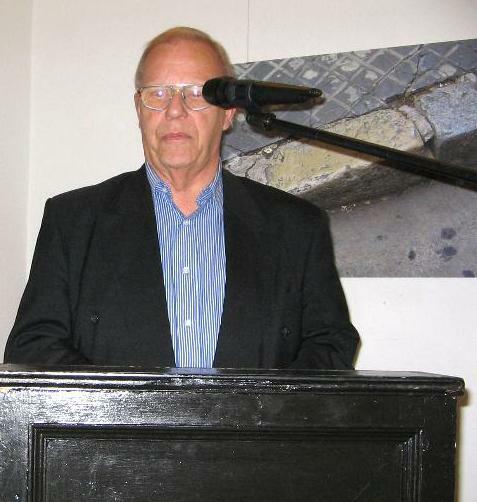 However, Andrej Tisma does not pronounce his warnings in a prophetic style, but with a serenity and calmness of a philosopher open to the world and as an observer with a sharp vision: he warns, knowing what we also know - that cakes are not intended to last forever, that even concrete can crumble, that everything goes by. A more serene aspect of this is Andrej Tisma's exploration of photography in advertising - what it actually brings forth - lovely shots of things which, when photographs are published are already gone, at the best - consummated - actually, they are an extremely transient genre serving one short moment, meaning that they are destined for quick disappearance. In short, Andrej Tisma is a clever artist who - through photography - brings closer to home the baroque wisdom, which we are prone to push aside. Still, our enjoyment today does not prevent tomorrow's end. Art, and especially this series of prints by Andrej Tisma, does not shock: it prepares us to see more clearly and bear what is coming.